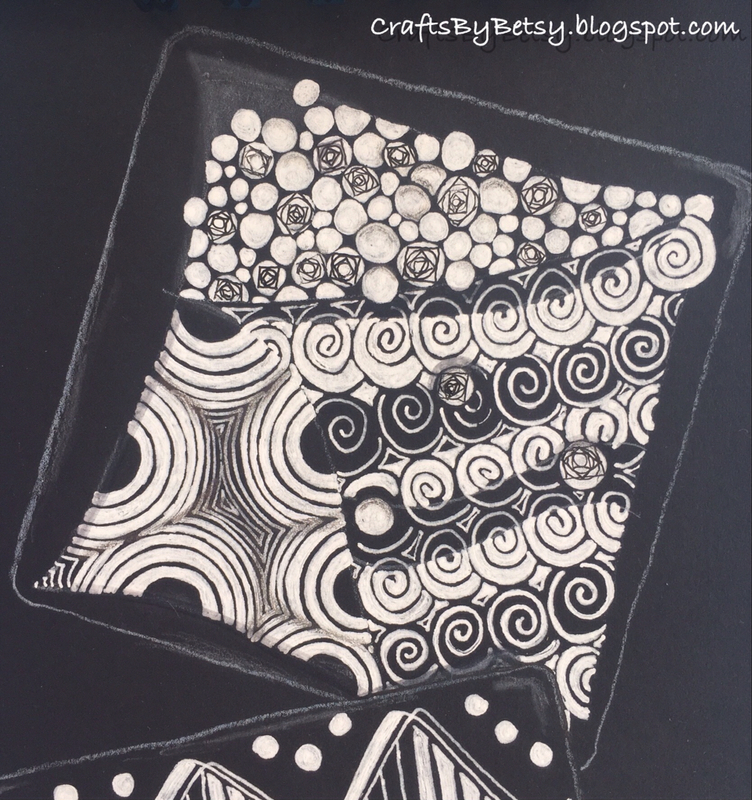 The Divas challenge #223 and recent Zentangle® newsletter both challenged me to take on umble again. I thought I'd try it on black, though there was no need to play with line width (more on that in a bit) as it has both thick & thin line width in the original pattern. 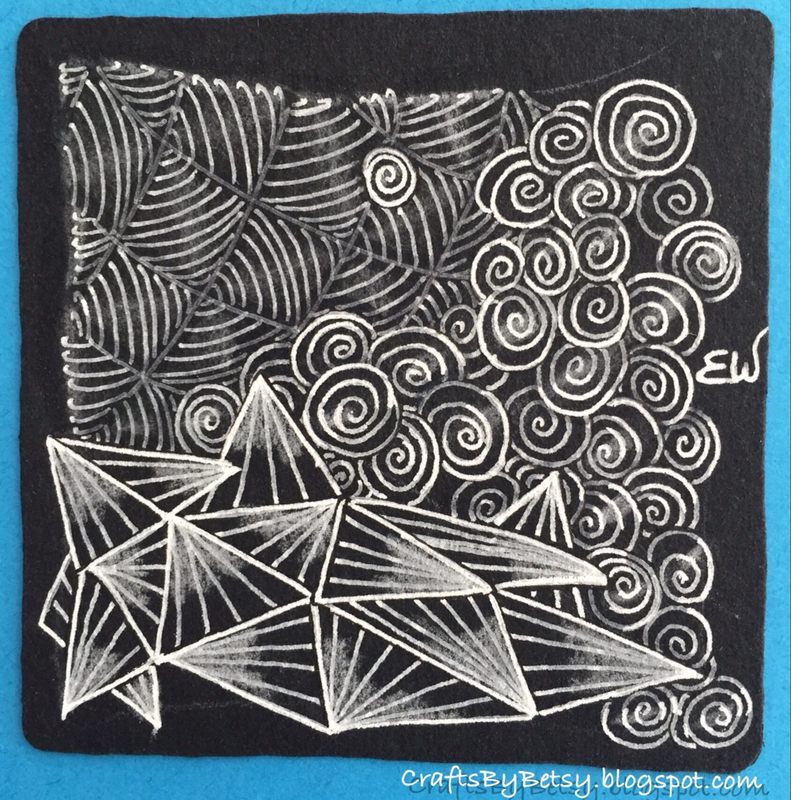 I did use "redefining the line" to go back and use my black micron to add a black edge to emphasize the Hollibaugh effect of the tangle. This made a big difference! 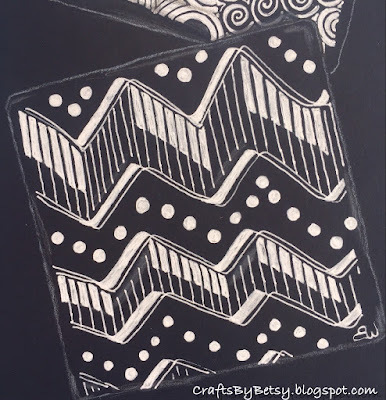 I also noticed the black Zentangle ATC is a much deeper black than the Artagain paper I used below. 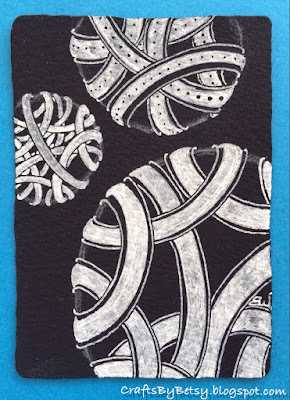 In addition to the ATC and Pigma micron most of this is done with the Sakura white Gelly Roll and a touch of Zenstone. 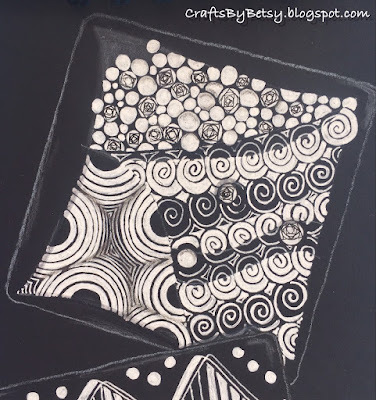 I was so excited after sending a link to my last week's post to Maria (yes THE Maria) and getting a reply that she'd like to reference my work when they came to black tiles at seminar! I was stoked! I had started a couple more "tiles" playing with line width and went to finish them right away, hoping to provide ample examples. I love the Raddox, but the top one is just as informative. While there are aspects of it that I love, it taught me that like shading, you can go too far with line width. It's the contrast that makes it work. If you missed last week's post, you can check it out here. I also wanted to get some color on the black. This is approximately an 6.5 inch by 7.25 inch piece of Strathmore Artagain paper that was scored to become a slider pen box for more of my pens. I used both Sakura Stardust and Metallic in addition to the white Gelly Roll. And I also worked on a more traditional black tile. 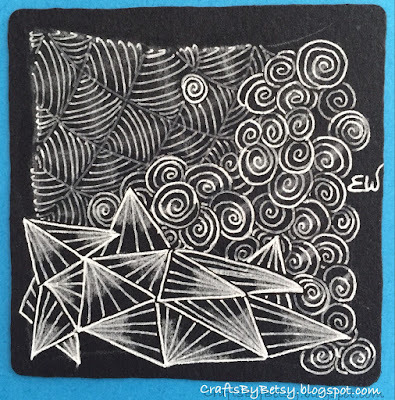 (Gelly Roll, Zenstone, Fabrico gray and black Pigma micron.) I always learn so much preparing for a new class! Oh, you are so smart to make the little adjustments you did with your black pen on your Umble tile, which, by the way, is wonderful! You really can show those of us who struggle with the black tiles some new tricks. 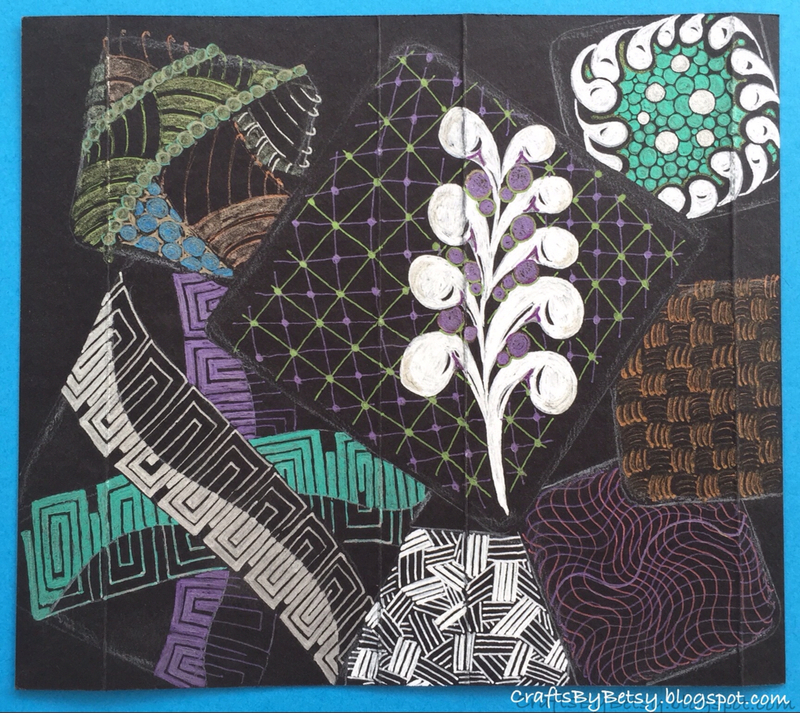 Working on black is a whole new ball game, and you are becoming a master! Thanks for sharing your thoughts and tips! Brilliant. I'm one of the people who struggles with white on black. Your suggestions are making me actually look forward to trying again. 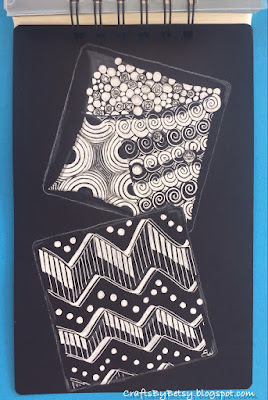 Congratulations on having the "Mother Ship" recognize and want to share your white and black techniques! You are doing so very well with white on black! Great work, your Black Tiles are awesome. Your black tiles are really spectacular! Wonderful your well-balanced black and white contrast! Wonderful! All of these are gorgeous! I especially love your "Umble"
J'aime toujours les dessins sur fond noir du fait du fort contraste. Le dessin avec 'Umble est très réussi ! I always love drawings on a black background because of the strong contrast. The drawing with ' Umble is very successful!. Oh, these are lovely black tiles, I like them! Love all these tiles. Perfect work!